I had the privilege of helping my sweet friend, Denyse, work on a couple home/furniture projects lately. I helped her update her dining room set with a little paint and stain and here’s what we came up with! 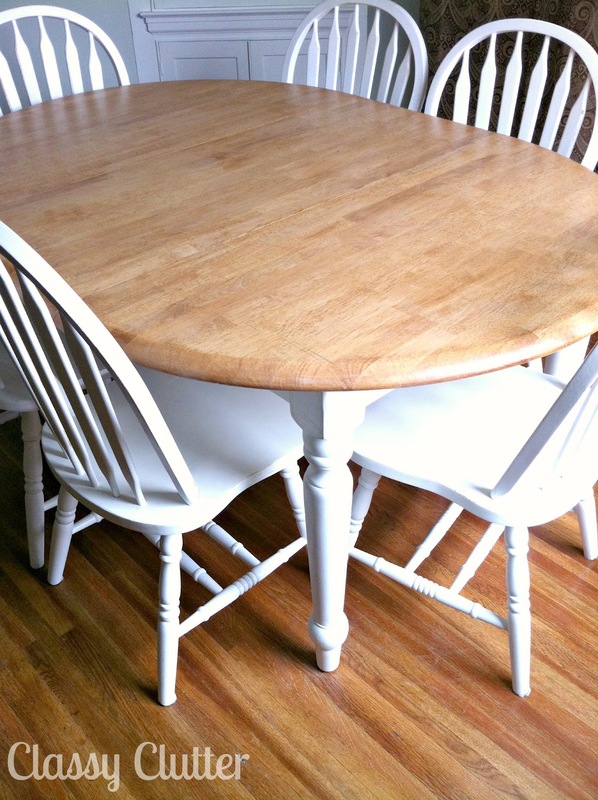 Chances are, you or someone you know owns or has owned a very similar dining set. The chairs and farm-type table were very popular for a loooong time. The blonde oak however, has seen it’s day if you ask me. Denyse was thinking the same thing when she asked me to help her paint it. It took us a few months to get started but as soon as her cute little 2 year old spilled blue food coloring on the table top, it was time to get to work! Denyse was fantastic and did the dirty work / my nemesis, sanding! She sanded it down and brought it over to my house. We sprayed it with my HVLP Spray Gun and air compressor for a flawless finish. Check out my favorite tools for painting here. 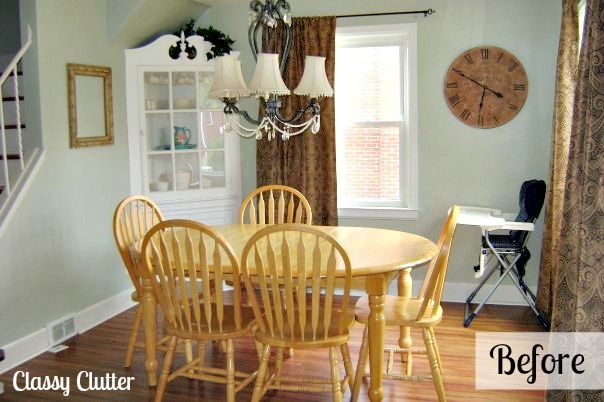 The paint color is Behr’s Swiss Coffee (just like my kitchen cabinets seen here). For the top, we used a cherry stain to match her floors. It turned out a bit lighter than the floors but I think it looks great! Her husband refinished the floors a couple years ago and they still had stain left over. Don’t they look awesome? I absolutely love this dining room. She found that chandelier on Craigslist for a steal. SO JEALOUS! Oh and see that adorable curio cabinet in the corner? It’s built in to her house! Double jealous. I love that we live in an area with old homes that have so much charm! 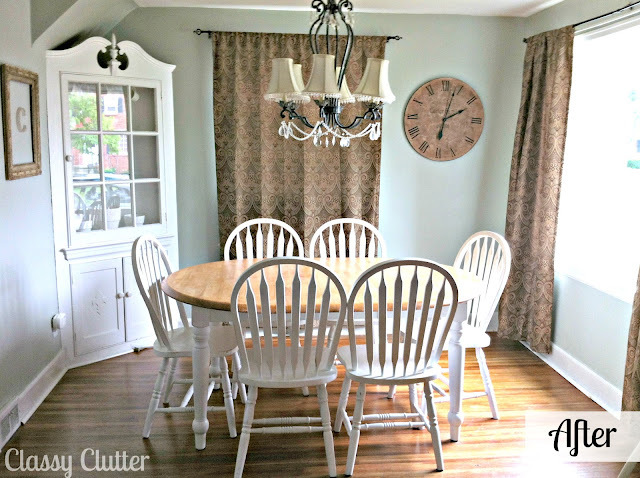 Thanks for letting me make over and share your dining room transformation Denyse! Looks great, much better than the light wood look. Wow, what a difference some paint makes. It looks great! This looks great!! I love how clean it looks. Funny thing is, my dining room table used to look exactly like this (except rectangular) and I had my father in law refinish it for us. The light wood just wasn’t doing it for me so we did the top in a dark walnut and now I just love it. I love seeing the before & after pics…It really does look so much nicer now!! Thank you again!! You’re so welcome friend! Thanks for letting me share it with my readers! Looks awesome! I love how it turned out! The white really brightens up the room. Great job! Yes! I have a set very similar to this at home and I’ve often wondered if I’d be able to paint it myself… I’ve been a bit scared to try in case I ruin it, but you’ve given me hope haha. looks so good!! 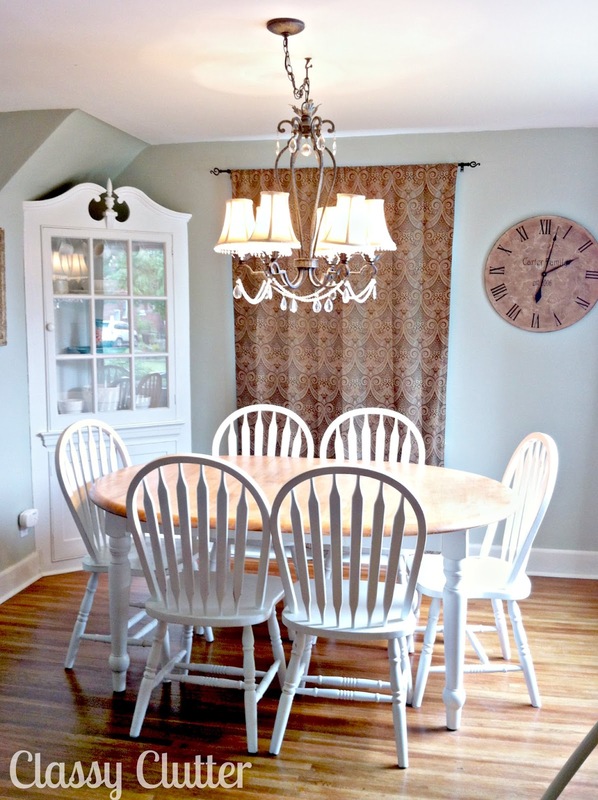 Love your dining room Denyse! so pretty and light and airy now! Great way to freshen up the set! Amazing what a little paint can do! I’ve got the same set and hacve wanted to paint it. Did she sand or prime the chairs before the paint? Mine have a glossy finish. Love how you painted the table! Looks so fresh. Would love for you to share this at my link party. Hope to see you there! I just love how paint transforms furniture – you made it look gorgeous! Look so much better! I may have gone with a darker stain on top, but the one you chose looks good too. Wow it looks like an entirely brand new dining room set!! You did a gorgeous job! I am so jealous of that craigslist find too!! Score!! Good job! You’ve made this such kind of simple and cheap dining sets into a better one.